Heat grill. Brush skin side of salmon with oil. In small bowl, combine all remaining ingredients except chives; mix well. Spread over top of salmon. When ready to grill, place salmon, skin side down, on gas grill over medium heat or on charcoal grill 4 to 6 inches from medium coals. Cook 10 to 14 minutes or until fish flakes easily with fork and flesh is opaque. Garnish with chives. 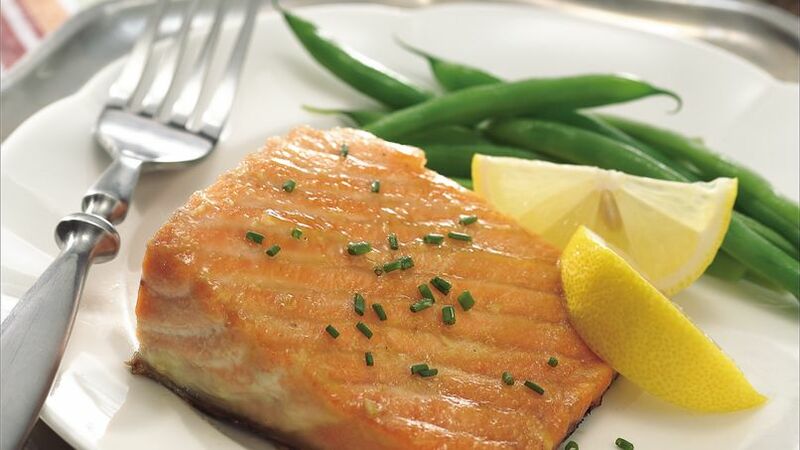 To broil salmon, place skin side down on broiler pan; broil 4 to 6 inches from heat using times above as a guide. Oiling the fish's skin keeps it from sticking to the grill. when using a fish grilling basket - even a nonstick basket - spray before placing the oiled fish within it.